The Woodlink Coppertop Cedar Hopper Bird Feeder is a delightful combination of rustic beauty and practical use that will surely add to any bird feeding sanctuary. Invite a flock of birds to feed comfortably at the substantial seed platform. This classic hopper style feeder features ample perching at seed feeding stations on all sides of the structure, so you will be sure to see a large number of birds munching at once. An internal seed baffle design ensures that all of the seed empties to the platform without leaving a dirty residue. The clear plastic reservoir panels keep the seed level visible at all times. The enormous 10.5 quart capacity will keep your birds from going hungry and prevent frequent trips outside to fill the feeder. You can go on vacation without having to worry about birds draining your feeder. The copper roof is hinged to make cleaning and filling quick and convenient. 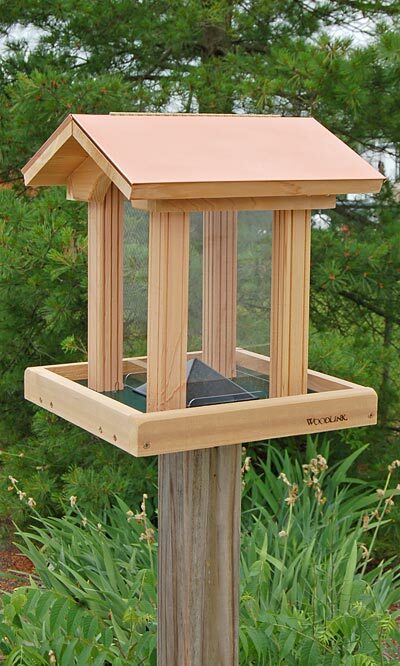 The feeder is made of durable, kiln dried inland red cedar and a copper roof that will add a rustic elegance to your birding sanctuary for years to come. As it ages, the copper roof will acquire a striking patina that complements the aging cedar well. This feeder may be pole mounted (not included). Made in the USA. Capacity: 10.5 qts., 15.75 lbs. Heath Telescoping Mounting Pole, Gray, 5' 6"
Heath Pole Mounted Squirrel Baffle, Clear, 13.75" dia. Wild Bird Seed Mix, Cardinal Blend, 5 lbs. Wild Bird Seed Mix, Waste Free Blend, 5 lbs.